March 26, 2018 by Antonio Diaz Leave a Comment The editorial content on this page is not provided by any of the companies mentioned, and has not been reviewed, approved or otherwise endorsed by any of these entities. Opinions expressed here are the author’s alone. See our disclosures for more info. 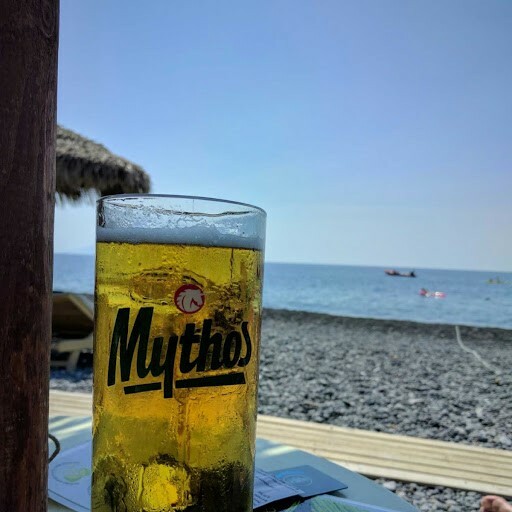 We absolutely loved our trip to Santorini this past summer and would definitely recommend for anyone to go. It’s a little tougher to use your points for hotel stays, but it’s not impossible. 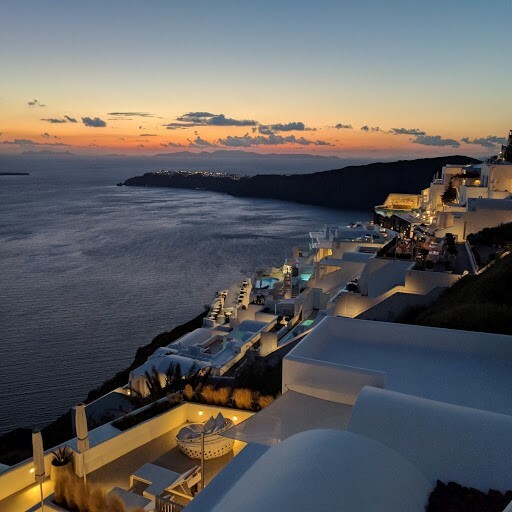 There are several flights from Athens to Santorini, and there are flights from other cities in Europe directly to Santorini as well. 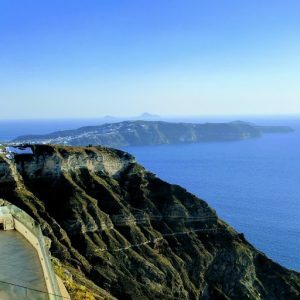 I’ll share some of my experiences and tips for Santorini. If you’re in Greece, there are several flights to Santorini, and the other Greek islands, via Aegean Airlines. This would be the route I suggest. There are many flights with low cost carriers, but I found that with all of the additional charges the price ended up being almost the same. Also, I witnessed first hand how strict European low cost carriers are with their rules. There were several tourists who thought they could pull a fast one by trying to sneak their oversized luggage onboard without paying the fees and failed. They checked pretty much every piece of luggage to make sure they fit the size requirements. If you’re not taking any or minimal luggage, then Ryanair, or other low cost carriers would be the way to go. 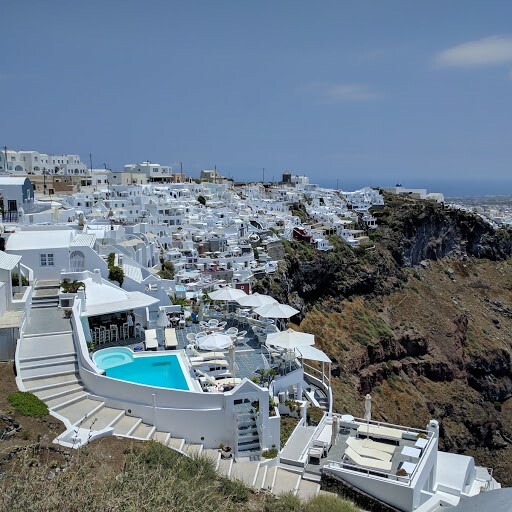 I paid for our Aegean flights with our Prestige card, so that I could offset the costs with my yearly travel credit. Plus I credited the miles flown to my Asiana account. Both my wife and I flew with a backpack and a carry-on with no problems. 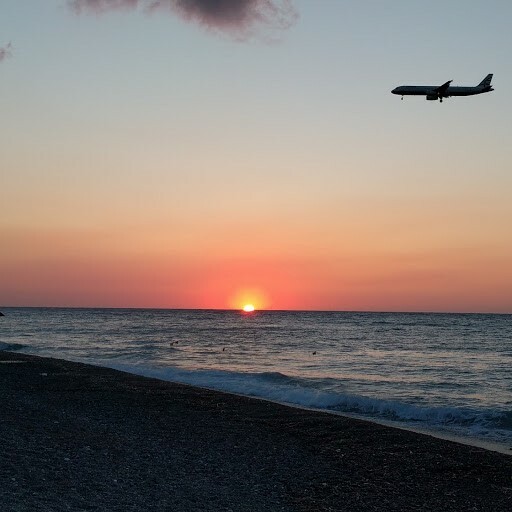 For the most part flights from Athens to Santorini or other Greek islands are fairly inexpensive. There’s not a lot of options for hotely loyalty points in Santorini. The options that I found were super expensive, and I didn’t think it was a good use of Starpoints. Because of this, it’s a perfect opportunity to use flexible points such as Arrival Plus points or Venture miles. You could search for nice properties through Airbnb or Booking.com, then pay for your stay with these flexible points. 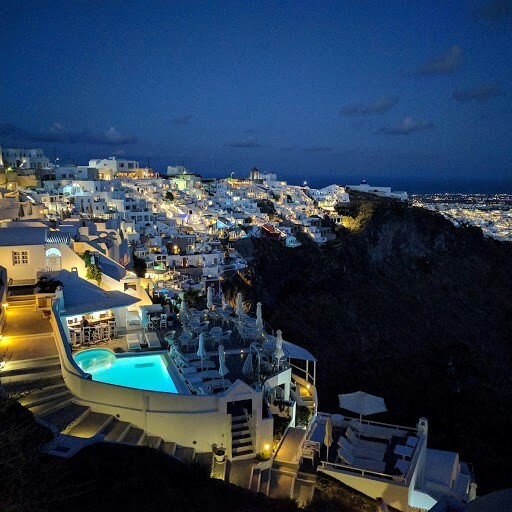 So I was debating where to stay in Santorini and after our trip I believe we made the right choice. The island Santorini has a crescent moon shape. The side that faces the Caldera is where the cliffs are at, with all of the Instagram worthy places to take your selfies. The other side of the island is where the beach is at, and this is where we stayed. Here’s my 2 cents on both sides of the island. As mentioned, we stayed on the beach side of the island in Kamari. We stayed at a very nice, clean place across the street from the beach. Kamari is very laid back, calm and relaxing. There are not near as many tourists on this side of the island which allowed for a lot of relaxation. The prices for rooms and food are less expensive on this side of the island. There are some very good places to eat in Kamari and pretty much everything is within walking distance. If I go back to Santorini, I’ll stay in Kamari. The cliff side of the island is what most people think of when it comes to Santorini. It’s beautiful! It’s more beautiful in person than what you see in pictures. The sunsets are amazing and there are many, many places to shop or have a drink. There are a lot of fine dining options on that side of the island, and overall prices are higher for rooms, food and drinks. The two things that I didn’t like about that side of the island was the lack of privacy from the rooms, and the large number of people. 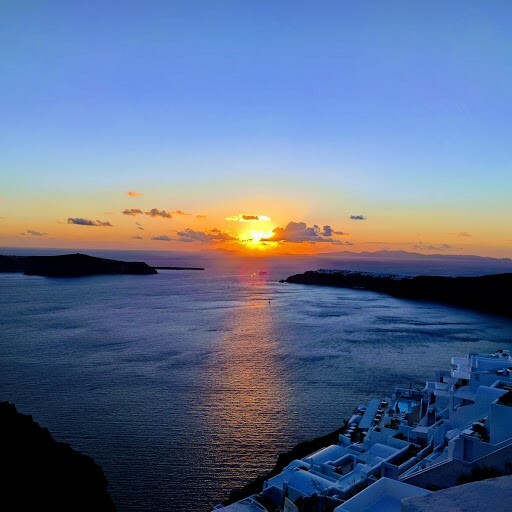 There are plenty of boutique hotels and apartments you could rent in Thira, Imerovigli and Oia. If you splurge you could get some rooms with views of the Caldera, plunge pools and private balconies. The problem, in my opinion, is that everyone walking around can see you in your private balcony or plunge pool. Depending on where your room is at, people could walk right next to you while you try to enjoy a private evening with your special someone. Also, there are a lot of cruise ships that stop on that side of the island which adds to the number of people invading your privacy if you’re staying there. The tourists from the cruise ships flood Thira, Imerovigli and Oia since they have a limited time on the island. They really crowd the city center when it’s time for them to board their ship to their next destination. With those things in mind, you could visit Thira, Imerovigli and Oia easily from Kamari by taking their bus. For about $1-$3 Euros you could take a bus one way to the cliffs and spend the entire day enjoying the sites, shopping, eating and drinking. 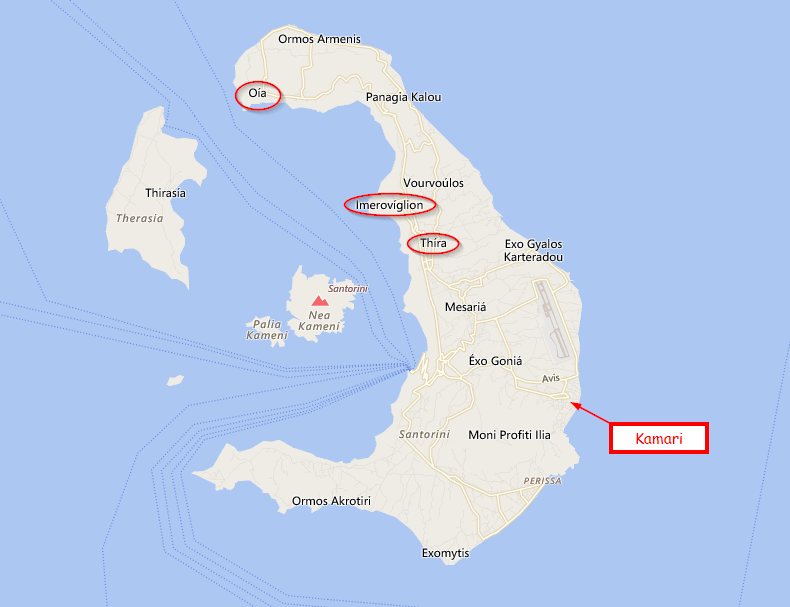 Then after you’ve had your fill of that side of the island, you could ride the bus back to Kamari to relax. Overall we had an excellent time in Santorini. The people are very friendly and the food is fantastic! It’s not a cheap destination, but it could be made more affordable by using points and miles to reduce or eliminate your flight and stay costs. I look forward to visiting other Greek islands in the near future.